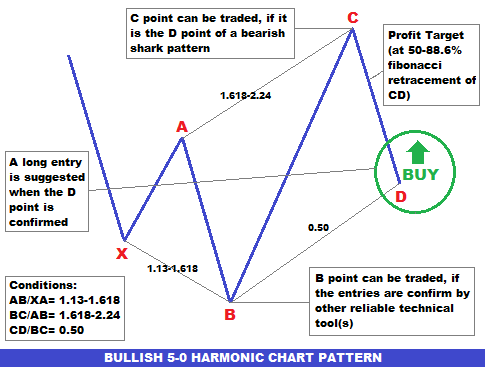 Bullish 5-0 harmonic chart pattern suggests a long entry upon completion of the pattern or confirming the D point of the pattern. This post explains the way to find or draw a Bullish 5-0 harmonic char pattern and the way to trade a Bullish 5-0 harmonic chart pattern. How to draw or find a Bullish 5-0 harmonic chart pattern on price chart? To draw or find a Bullish 5-0 harmonic chart pattern on price chart, first of all, we need to find the X and A points of the pattern. The X point is found at the bottom of a strong bearish trend, and the A point is found at the top of a pullback. Now we need to draw a fibonacci retracement tool from X to A to find the B point of the pattern. 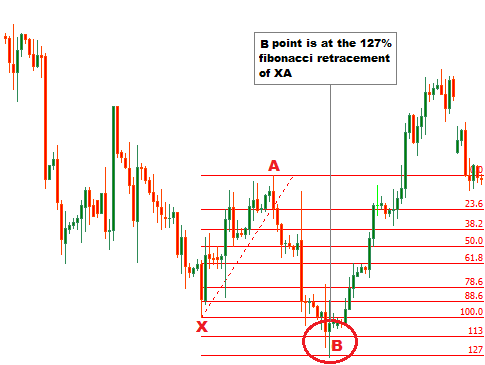 The B point should be within the 113%-161.8% fibonacci retracement of XA. In this case we can see, B point accurately satisfied the AB/XA= 1.13-1.618 condition of the pattern. See the illustration below. In next step, we will draw a fibonacci retracement tool from A to B to find the C point. 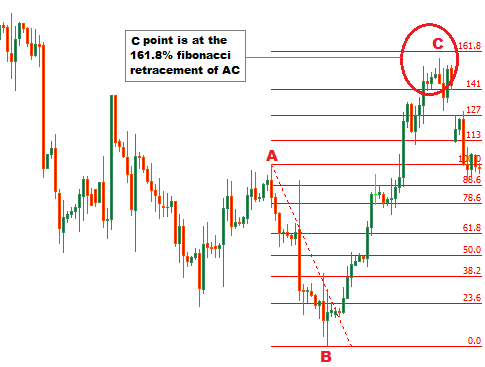 The C point should be within the 161.8%-224% fibonacci retracement of AB. The C point of this pattern should lie within the price levels found from formula (IB) and (IIB). This satisfies the BC/AB=1.618-2.24 condition of the pattern. Look at the following illustration. In the final step, we will find the entry point, D point, of the bullish 5-0 harmonic chart pattern. To find the D point of the pattern, we will draw a fibonacci retracement tool from B to C. The D point should be at the 50% fibonacci retracement of BC. How to trade the bullish 5-0 harmonic chart pattern? A long entry is suggested when the D point of the pattern is confirmed. The stop loss for the order should be placed at the lower support level. 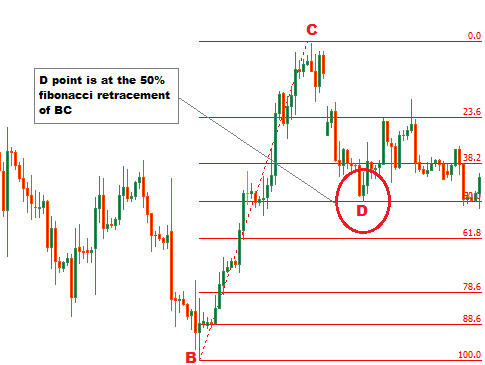 The profit target for the order should be placed within the 50-88.6% fibonacci retracement of CD. The C point can also be traded, if it is the D point of a bearish shark harmonic chart pattern. The B point can be traded, if the entries are confirmed by the other technical analysis tool(s).